Possibly Unfit Father or Possibly Dangerous Lawn Pesticides, which was more important to George Smitherman! Was Christopher Peloso Medical History provided when adopting 2 children in Ontario? Imagine Peloso taking care of these children alone and having a medical emergency! All persons living in the home must have a medical examination that confirms their capacity to care for a child or youth safely and indicates that no medical conditions exist that might present a risk to a child . The agency provides a questionnaire that is to be completed by the physician. Having a medical condition does not automatically mean an applicant will not be approved. 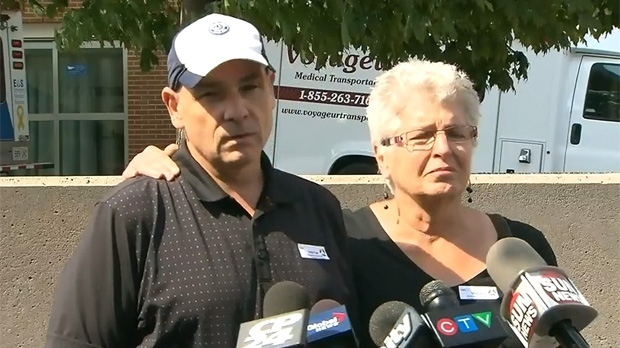 Former MPP George Smitherman is flanked by friend and former Toronto mayor Barbara Hall as he tells reporters that his husband, Christopher Peloso, has been found safe Wednesday, September 11, 2013. The 39-year-old Peloso was found weak, but alive near railroad tracks after being reported missing a day earlier. Former health minister George Smitherman released a statement Monday saying his family is “on the mend,” weeks after his husband was hospitalized after mysteriously disappearing for two days. Smitherman – who once served as deputy premier and ran in Toronto’s last mayoral election, released a statement Monday morning thanking those that have supported him in the wake of the disappearance of his husband Christopher Peloso. Peloso disappeared from the Smitherman family home Davenport Road and Bathurst Street on Sept. 9 and was then found near railway tracks in the city’s west end two days later. At the time police said Peloso was found lying down in a fetal position near a fence by the tracks and was weak and groggy. The reason for Peloso’s disappearance has never been publicly disclosed. Peloso and Smitherman married in 2007 and have two children together. Smitherman was Ontario’s first openly gay MPP. via Smitherman says family is on the mend after husbands disappearance | CP24.com.